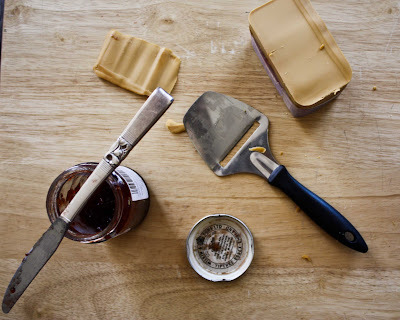 If you've never been fortunate enough to try Norwegian brown cheese, or Gubrandalsost, Brunost and Geitost, as it's variously called in Norwegian, I should warn you not to expect a typical cheese experience. Although rare in the US, brown cheese is absolutely ubiquitous in Norway. Every household seems to have a brick sitting in the refrigerator, and they even make little red, plastic lids that fit snugly on top so that the package needs only to be pulled down around the edges and no extra cling wrap is required. My fiancé is Norwegian, and when I tried to remove the package completely from our brick for the sake of aesthetics, I was told in no uncertain terms that this is not how it's done. The package evidently is meant to stay on, fitting snugly around the cheese so that it holds its shape and its freshness is preserved. Since the appearance of The Omnivore's Hundred over at Very Good Taste, there have been several mentions of brown cheese on various blogs. Although I think the suggestion of paring it with a crisp fruit such as apples or pears is very inspired and most likely absolutely delicious, my fiancé is adamant that this, too, is not how it's done (who knows, he may only be speaking for his part of Norway, which is the south-west part). However, when I've been in Norway, the way I've seen it eaten is thinly sliced (it must be sliced with a cheese cutter, not with a knife, in order to achieve the correct thickness), on a wasa cracker, sometimes accompanied with strawberry jam. I have never seen it rolled, eaten on plain fruit, or cut thickly into chunks the way we in the US might snack on a brick of cheddar. Brown cheese is surely not for everyone, it's almost sweet at first, and has an aftertaste sometimes described as "weird." Certainly it's a strong flavor, which is why it's sliced thinly, and its creamy consistency is a perfect match with the hearty wasa cracker, which really helps to cut some of the sweetness. In fact, my fiancé claims that brown cheese comes in its distinctive square shape specifically to fit on this type of cracker. Personally, I'm completely addicted and often find myself craving a little brown cheese treat. So if you're brave enough to try, try it the Norwegian way. Although I must admit that my next snack will probably include a strip of cheese, a wasa cracker, and a few thin apple slices. Even the classics, after all, can be improved. UPDATE: Norwegian brown cheese is typically a goat cheese, in which the milk is boiled, along with the cream and the whey, until the water evaporates. The heat caramelizes the sugars in the milk which gives the cheese its characteristic color and flavor. I've never tried this cheese, and as a big fan of all kinds of cheese, I'm curious now! Is it made from cow's milk? And, why is it brown? I love, love mesost - I call brunost mesost. Some people seem to hate it, but I think that it is one of the best cheeses ever. I am lucky enough to be able to buy some mesost from here too. Its the first time i heard that the cheese was shaped to fit on a cracker, asumable the crackers is much newer then the cheese, so this wouldnt be true. Generaly the description is caramelic in taste or whatnot, and in fact you get it both in hard version which is what is called cheese, and in a type of paste called prim. Generaly brown cheese is eaten on full grain bread, with preferably a cup of hot chocolate beside these days, and its standard on the bread when we go ski'ing. The cheese's origin is actually Norway, while the Swedes know a good thing when they see it, so it's also popular in Sweden, and the cheese is also produced there. The brand I show in the picture is a Norwegian brand, however. 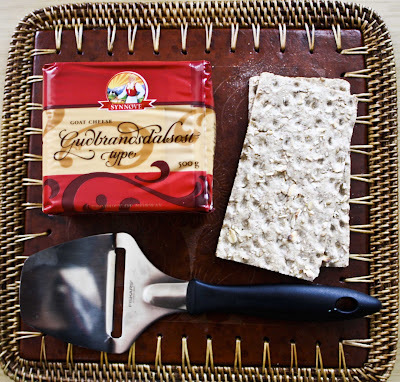 Perhaps it's the wasa cracker that's shaped to fit the cheese, but regardless, they are perfect partners. And she breathed, is there a Norwegian Seaman's Church in Singapore? There's one here in New York, and that's where I get our brown cheese, so that might be a place to start. Good luck! I LOVE brown cheese. Thanks for the post. they ran out!! and next batch only in 2 months :( just my luck.. haha. Brunost on warm freshly baked bread with butter. 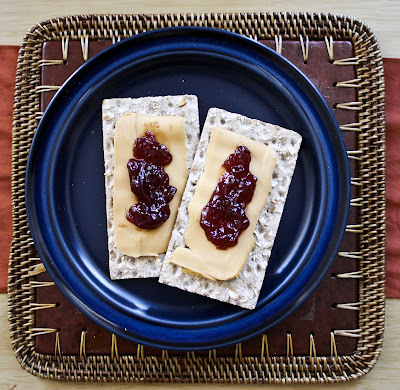 Brunost with basically any jam - not citrus (oranges, lime). I went Norway recently and had this brown cheese with waffles. It was fantastic!!!! Could cherns or _and_she_breathed tell me where can one get that in Singapore? to Anonymous. fløtemysost, ekte geitost, gudbrandsdalsost and bestemorsost are all brunost. Just like many norwegian don't specify wether they are talking about norwegia, jarlsberg, gräddost eller edam, or which kind within these brand of cheeses, instead they just say kvitost or gulost, is the same as we'll just say brunost to all cheese that is brown. 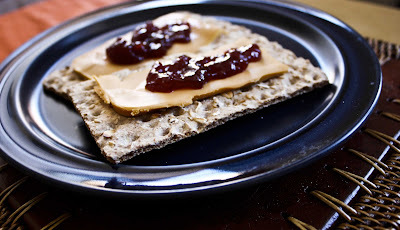 Therefore it is correct to say that the geitost that is most common in Norway is a brunost. I know Tine has a cheese named balsfjord kvit geitost which is light in the colour, however most norwegians will think of the brown one when you say geitost. As far as i know there is only two of brunostene that is actually called brunost, and that is litago brunots and ludvigs brunets, both of whom are fairly new on the marked. All the other ones have more specific names within the brunost-category. to Andrea; next time your in Norway you should try ekte geitost. The taste is sharper than the other brunostene, but so much better. It comes in both the squared package and a round one. As of how to eat it, it is great with fruits or jams. When i was a kid my dad thought me to take a slice of cheese and roll it into a tiny ball, and then eat it as a snack. When I got older he showed me how to put a little bit of jam on the slice, than wrap it around the jam, and then roll, so i ended up with a ball of cheese with a center of jam. My mother has always eaten it with sliced apples on top, so you just go ahead.